It's been a busy few days! I've been experimenting with my serger, figuring out what it does and, occasionally, having to bend to its whim. My sewing machine hasn't been suffering from lack of use, though. I did break two needles on it in the last week, and I just couldn't figure out why until today. Turns out that the needle kept hitting on the plate of metal (can't recall the name of it, but it's the piece that the feeddogs come up through.). So I unscrewed it, filed the edge down, cleaned a frightening amount of lint out of the parts, and screwed it back in. As far as I can tell, that fixed it. On Tuesday I dyed an old set of sheets that had been stained and worn thin. I had just poured the dye mix into the water with the sheets when I thought, "I should've taken before pictures!" But they were a very light blue color with pretty little flowers dotting them. Now they are a dark purple-y blue. (I used dark blue Rit dye.) My plan is to make a dress out of them using one of these tutorials. 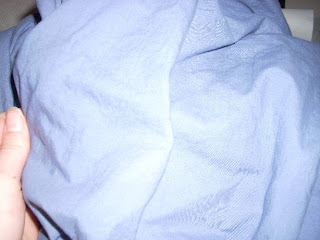 It was so fun to watch they sheets get darker and darker, and then as I rinsed and dried them, lighter and lighter. I didn't use the washing machine for it, but instead did it in a bucket in the sink. Washing machine would have been faster and easier, but who knows what it would do to the machine itself? I've been playing around with the yards of jersey knit I got when I was in the city. I got some super-on-sale green and black striped fabric that reminds me of Wicked (and therefore, I had to buy it), but it wasn't until I got home that I realized that it was see-through. It's been a challenge making things such as this top. I don't really want to line the whole thing in another layer, but that's probably what I'll end up doing. I'm going to make it into a funky halter still, but for the meantime I set it aside. Screen printing is one of my new endeavors. Ingredients: Embroidery hoop, synthetic screen or pantyhose, mod podge, paint brush, a design, fabric paint or screen printing ink, cardboard, and music to help pass the time. 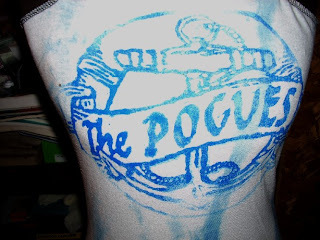 I tried this with a Pogues logo. Note to self: Do not use highly detailed images. I screwed up a little bit, but next time will be better. The nice part about screen printing versus a stencil is that you can print an image over and over, whereas with a paper stencil, you can get maybe two prints out of it. 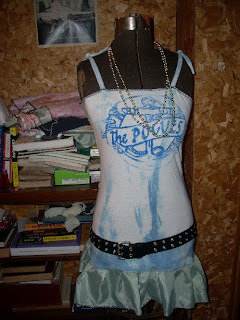 It had been just a plain XL men's tie-dye tee, but since the image was off-centered (thanks to my brilliance), I cut it up and made a long, long skirted top thingy. If I was a lot shorter it maybe could modestly pass as a dress, but as I'm not I'll just wear it over jeans. I basically just resized it, added straps, and added a pleated bottom out of some scrap material. For some reason, with the mardi gras beads, it reminds me of a flapper dress. Anyway, it was fast-- it took maybe 80 minutes to make. I've been going tutorial crazy. I wish I had a reason to make a bunch of things for myself! Again, I give you this link. It has amazing tutorials for pretty much everything.